Tyler and I got married just about 6 months ago (hooray!) After celebrating with friends, moving from Cambridge to DC, and honeymooning in Thailand, I’ve had a bit of time to reflect on our “wedding planning process,” and how my work as a designer/strategist played into it. The way I see it, my background as a designer/strategist came in handy for two reasons. First, I can design and make stuff. And not only do I have the skills to design and make stuff, but it’s pretty much my passion. As I learned from reading various wedding blogs, this is not always the case and there are many brides-to-be who hate Martha Stewart with just as much passion. So, being able to design stuff was handy. Second, I know how to plan things. In my professional life, working on projects where a lot needs to get done in a set period of time, my strength has always been scoping out “the plan” for who’s going to do what, when (Heck, I even do this for Thanksgiving dinner). Lots of to-do lists. I kept so many lists. 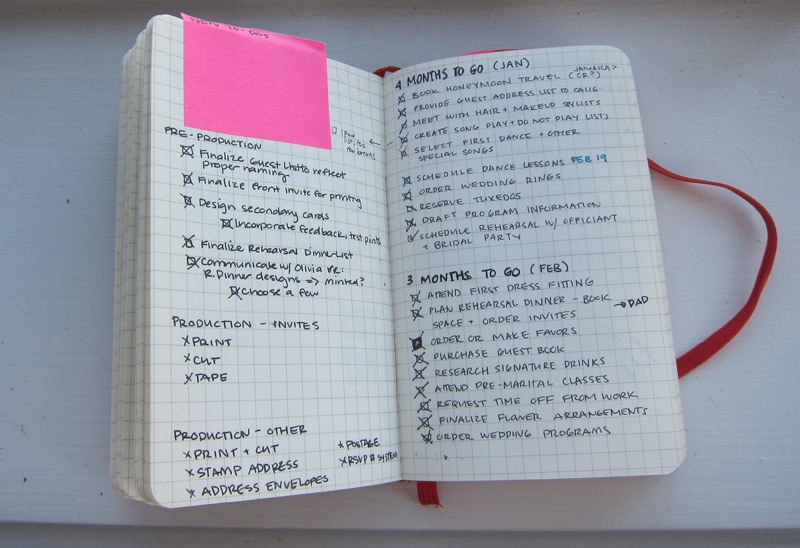 Running lists in notebooks, deadlines listed on calendars, lists to bring to the craft store, and many, many more. Because I’m no expert in weddings, I turned to some experts to make sure I wasn’t forgetting anything major. A Practical Wedding and Paper Source were both helpful, as were the timeline sheets from Russell + Hazel. But, importantly, I paired down these into my own lists because one thing you quickly learn about wedding planning is that a huge part of it is identifying what parts you want to do and then eliminating everything else from your mind. Obsessive Calendaring. Tyler kind of freaked when he saw how many things I wanted to craft for the wedding. To assuage his fears, I mapped out all of my ideas on monthly calendar pages and showed him that if I did this on that weekend, we’d be fine. I also promised him that if certain projects weren’t meeting their deadlines, they were out. And believe me, that happened – eliminated ideas included the one where I thought I’d crochet myself a wrap to wear at the rehearsal dinner, the one where I planned to paint guest’s names and their table numbers on stones that would sit on a bed of moss, and the one where I planned to create blurb books of photos of our friends to have strewn about at the reception (yes, a little ambitious). The Big Notebook. I’ve already written about how I love to Idea Log, so it should come as no surprise that I kept a log for wedding stuff. Actually, I split my thoughts across three notebooks: the pocket-sized red moleskin (above) that I could carry everywhere, a sketchbook for exploring ideas in more detail, and this massive binder for collecting, well, everything else. I probably went a little overboard because that’s how I roll, but in it I pasted images from the web and magazines, saved contracts and contact info, and kept sketches and revisions of various designs. It was anything but practical to carry around, but its a neat thing to look back on, since it captures the year+ of pre-wedding frenzy pretty accurately. Harvey Balls. If you can believe it, we actually used Harvey Balls to choose our venue. In my professional life, I’ve used Harvey Balls as a way to evaluate opportunity spaces or concepts across multiple criteria. In the case of our venue, we needed to make a decision, fast, and this was a really good way for us to talk about the aspects of a venue that mattered to us, even if in the end we didn’t follow the ratings to a T. Not exactly romantic, but definitely useful. In any case, I had a great time working with Tyler to DIY our way to the wedding. For me, it was a chance to focus my crafting energy on one, big event, and a time to stretch my planning muscles on personal projects. For the two of us, it was a great experience of dreaming up ideas together, working with talented folks to make them a reality, and overall creating a wedding that we were just so happy with. We’re so excited with how it went, and also pretty excited for what’s next! So thorough! I think Lisa and I could have benefited greatly from similar preparations in terms of day-of stress level management. Thanks for letting us in behind the scenes of your beautiful wedding! We missed you too! Hope you, Maria, and Lewis are all doing great!